Ummar-Personal Blog to Share Knowledge – Share Knowledge,Help others nothing is impossible and Sky is Only LIMIT. Share Knowledge,Help others nothing is impossible and Sky is Only LIMIT. AJK FPSC B17 – Scam or Strike on Employee Rights? I am out of blogging but this issue forced me to write about an alleged scam (or may be blunder) of Azad Jammu Kashmir Government. Around 10 years ago, AJK government hired around 500 people on FPSC BS17 as lecturers/Computer teachers without PSC on contract. They were told that they will be given PSC exam and get themselves permanent. Government notified the employees about the exam just a week ago. The government came out of sleep 10 years after their recruitment to give PSC exam. Each candidate had to obtain 50 marks out 100 to pass the exam. Question papers was completely plagiarized and was lacking originality. Most of the questions asked in that questionnaire were out of scope for the old employees. Yes, indeed they did their degrees a decade ago. If PSC members can’t produce an original paper, do they deserve to head to the committee to hire the people in the same field? Old employees include many females as well, earning bread for their family. If they get fired, they can’t apply for another job due to the age factor. This issue isn’t about the merit, but the bread and milk of 500 families. The protest, which is the democratic right of every citizen of an independent state, lead to the arrest of many employees by police. I have attached some images which are Just for originality reference if anyone is interested in checking every question I have uploaded question paper just write words from question in google & result will be shown instantly. Questions are copied in such manner that even choices are not shuffled, formatting is exactly similar. Most used sites 1 night before making question paper. Recently i visited A telecom company POP(Point of presence -a remote network operations center).I am not mentioning the place & the person who get me in there because there are some secrecy concerns & some confidential information, pop is located somewhere in Pakistan which is operated by a most powerful telecom company having fiber backbone in probably all cities of Pakistan, the pop where I went connects some major cities including Islamabad, Murree, Taxila, Abbottabad,Mansehra and some small cities on way. The NOC was full of Routers, switches, firewalls and media converter & fiber metro switch connecting some corporates including universities comsats etc. The operator had maintained tier 2 standards. BTS of Warid telecom is also located on 2nd floor of building which is On 4G LTE most advanced (not always because LTE advanced pro (4.5G)is already deployed by some operators) but is was good and professionally maintained. Although it was a great experience for me i have spent almost 10 hours there to understand the network topologies and actual in/out. Aoa hope everything fine last days i was working on my semester project of database .PS Database is a core subject of my course i have to devolep a fully functional database system and free to use ant frontend application. me and my project mate are decided to make front end in android but after few days because i am not able to work on android i lose my interest on it. i started working on PHP spreatedly but database of both of us was centralized i dont have any background knowlwdge of web or php but i have passion to do and trust that i am able to do it & at last in 5 days i have done with it.We face lots of difficulties making the project but at last we made it later i have uploaded source files on github also.Our Teacher Dr.Eraj Khan gave us excellent & good remarks.This project makes me very confident The result is a person can do any thing if he/she is commited to him/herself & trust on his/her skills. Entrepreneurship is most discuss term now days. What is an entrepreneurship? Why should i do?How i Become an successful entrepreneur. If you Love what you do & have an idea + skill but want to implement your vision and develop the product/service for long-term success then this guide will help you through process. Identify yourself .An entrepreneur must have the have a clear vision in mind. How you implement that will determine success. I will talk about some pre-steps for entrepreneur and after that i will discuss how to avoid something and them conclude all the discussion. Test you idea at lower level,Identify problems and fix them rather then implementing at higher level gain some feedback what others say about this. Ask questions, do research and gain experience to help you learn your market , including the key suppliers, distributors, competitors and customers.investigate flaws in current product and make your product better than competitors. A famous saying is that “If you want to go fast go alone and if you want to go far go with team”.Finding the skill sets and attitudes that support you and the brand you want to promote.Include peoples from outside the company for the people you rely on. ———————————————————————————————————————————After Reading an article on entrepreneur.com.I finally decided to add more words to my article ask yourself these questions & & obviously answer with”Yes”. 1. Can you afford financial,risk? You need to understand the big financial risk associated with starting a business. Your idea may flop, you may be unable to pay yourself for a long period of time and there is always the possibility of losing it all. If you already have a stack of financial obligations, start your business on the side. That scenario may not be ideal, but it’s still possible to find success this way. If you don’t have those obligations, and you fully believe in your idea, then go all-in. 2. Do you have a strong support system? If you decide to start a business, the road is going to be filled with bumps and intersections, each with multiple options; you will have questions, lots of them. It’s important to surround yourself with a support system that will be there to help you solve problems, seek answers and be available when you just need to vent. Having family, friends, mentors and industry connections to turn to will greatly increase the odds of your business being successful. The moral support alone is priceless. Keep the doubters away. They are toxic and need to be avoided if you desire success. 3. If you keep getting knocked down (and you will), are you going to keep getting back up for more? You are going to get knocked down — most likely several times. There is also the possibility of making a wrong decision that causes you to fall flat on your face. If you are expecting to hit a home run the first time you go up to bat, you may as well not even play this game. You’re going to strike out. You’re going to become frustrated. What differentiates the entrepreneurs that quit from the ones that go on to experience success is the latter group’s tenacity — their willingness to keep taking devastating punches and their willingness to keep getting back up for more. 4. Can you remain motivated, even without personal luxuries and conveniences? Could you remain 100 percent motivated while sleeping on the floor and eating mac and cheese or Ramen noodles? If not, entrepreneurship may not be for you. It’s often the personal sacrifices that make the biggest difference. Would you sell your car and take public transportation to your office if that meant being able to invest more money into your business? Would you sell your house and move into a small apartment if that meant being able to grow your business faster? 5. Do you understand that your work/life balance will be extremely unbalanced in the beginning? Most of your time will need to be allocated to your business in the beginning. You will see your friends and family less and miss out on a lot of the little things you used to do — like getting together for beers after work on a Friday and taking weekend trips. Instead, you’ll have long nights at the office and work-filled weekends. You have to be willing to put in the time and effort in the beginning. When you start a business, everything is on your shoulders. It’s an enormous amount of pressure that some can’t handle. Over time you will be able to create a healthier work/life balance, but understand that it will be very unbalanced in the early years. 6. Can you envision your success? You need to wake up envisioning your success. You need to have that picture engraved in your head. You need to dream about it when you go to sleep. So, have you answered “yes” yet? 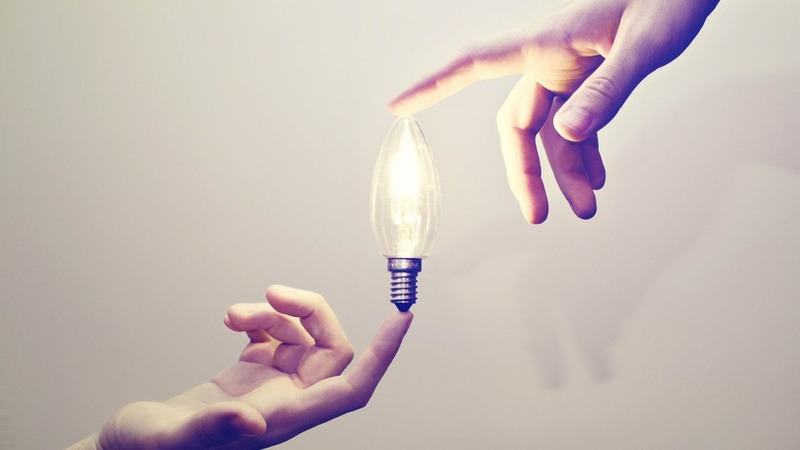 You can get latest updates about desi innovations in Pakistan you can also join some groups,frequently visit these sites given below to get informed about new ideas and startups. Writing this post because couple of thoughts in my mind with people sayings.I will share my own opinion because i own my business( a small one but something i really have).At some time i thought skill is very very important when i only got skill with no public dealing and connections and obviously when no one knows you you can’t show your skills but from time to time when i jumped in business world i learned that connection is also very important for example a ignorant person will do something bigger than a skilled person if he/she have more than one connection from both side buyer,seller or engineer and investor in case of some project. The question skill vs connections originally raised on quora let’s see which is important. For most of history, knowing the right people was crucial if you wanted cash and cache. In a Harvard Business Review article entitled “How to Build Your Network,” Brian Uzzi and Shannon Dunlap contend: “Networks determine which ideas become breakthroughs, which new drugs are prescribed, which farmers cultivate pest-resistant crops and which R&D engineers make the most high-impact discoveries.” They cite the 1998 work of University of Pennsylvania sociologist Randall Collins, who showed that breakthroughs from icons such as Freud, Picasso, Watson, Crick and Pythagoras were the consequence of a particular type of personal network that prompted exceptional individual creativity. But with tools such as LinkedIn and Facebook, the ability to network is becoming more democratized. If before it was difficult to ferret out the perfect contact, today finding a right geek in USA or the genetic researcher in Pakistan is as easy as a Google search. And social media has made it even easier to connect with that person. As for capital, today it is relatively plentiful and accessible, and it is easier than ever to get access to people who have it (accessing capital can be as easy as sending an email). Information, too, has been democratized. It used to be that if you wanted to get access to cutting-edge ideas in technology, you needed an invitation to an exclusive conference like TED(TED is a global set of conferences run by the private non-profit Sapling Foundation, under the slogan “Ideas Worth Spreading”. ), or to attend a university like MIT. Today, TED lectures and MIT courses are offered for free online. The only barrier to most of the world’s best information is knowing English. Because it is so accessible, public information offers a less competitive advantage than it did previously. Given our hyper-connected world, could it be that who you know, while still important, matters a little less than it did in the past. In today’s world, if you know something really compelling, you will be sought out — and sought out directly. I will follow the World Wide Web equivalent of the Yellow Brick Road to come to you. In the past, the people with connections were gatekeepers who controlled access to the elite circle and got paid handsomely for it. Today, people who invent interesting things (the true What-You-Know people) will reap many more rewards than the brokers who make introductions. Even professions such as banking and law are becoming more specialized. The lawyer who understands the intricate tax implications of U.S.-Brazil joint ventures is now much more valuable than the generalist lawyer who introduces you to that person. In the new world of abundant capital, easy access to information and people with knowledge, it’s what you know rather than who you know. Conclusion is that both are very important if you want to live a successful life and wanted things can be done in good manners.You can do you some search on WWW to find right people of your choice these days it is much more easier than history we have professional network like linkedin and also social networks like facebook,twitter,behance & many more. As a Brand Ambassador of truecaller i am writing this blog post to spread knowledge about truecaller. Truecaller( A Swedish company)Truecaller offers an ‘integrated’ phonebook, that’s to say that it marries your contacts’ telephone numbers with their presence on social media, email address, etc.Truecaller is a smart phonebook it solves pain point for billions of Mobile phone Users who use their phonebook to find contacts. The Truecaller is like a global telephone directory that has caller ID, social media integration and call-blocking functionality. – Over 100m users globally. – Adds more than 250k new users/day. – 1.6 billion phone numbers in the database. – Over 2b searches are made in Truecaller every month. – Block more than 6m spam calls/day. – We have 70 employees around the world – 35 nationalities! – 37 Brand Ambassadors and counting! – 500 Truecrew applications per week. 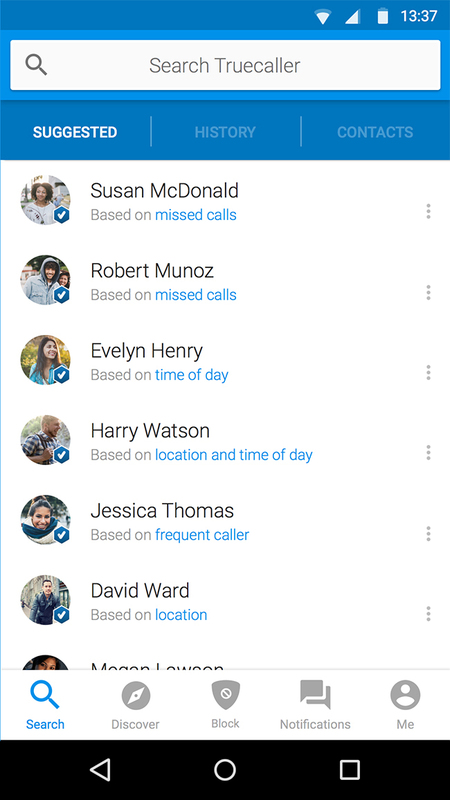 Truecaller will not share your contacts publicly keep in that in mind you can give access to truecaller to access your contacts to help others to better recognize callers.Users can control how their contact information is shared, and how others can contact them. No personal information is available to the public unless you agree for your contact information to be shared through Truecaller. Truecaller is compatible with all major platforms including Android, iOS, Windows Phone, BlackBerry and Nokia feature phones. A smarter way dial a number alternative to legacy android dialer. Truecaller also ‪‎Partnership‬ with Cyanogen OS to replace default android phonebook & dialerRead more here. In my opinion is it Just another way of spying on people. Like what they already have is not enough? They now going to track and record who we call and who call us and their information? When you have facebook installed this gives all you and your phone up already allowing every type of permission. Truecaller also supports a new feature in android phone Android users now can be browsing anywhere on their phone, copy a phone number, and Truecaller will instantly try to identify the number and give easy access to calling or texting. Download Truecaller to know who’s calling and keep spam out! Truecaller is available for download for Android, iOS, Windows Phone, BlackBerry and Nokia feature phones. Truecaller is also designated as Top Developer in google play Store. 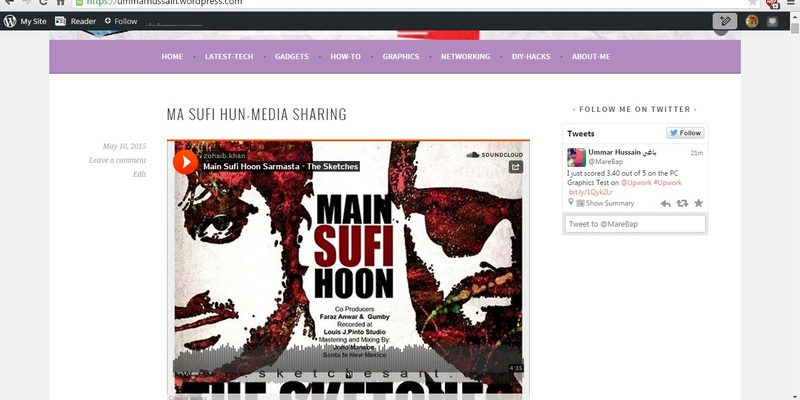 Once you have located a song to embed (via search or Explore), look for the “Share” button. NOTE: If a track doesn’t have this button, you will not be able to play it outside of the SoundCloud web site. 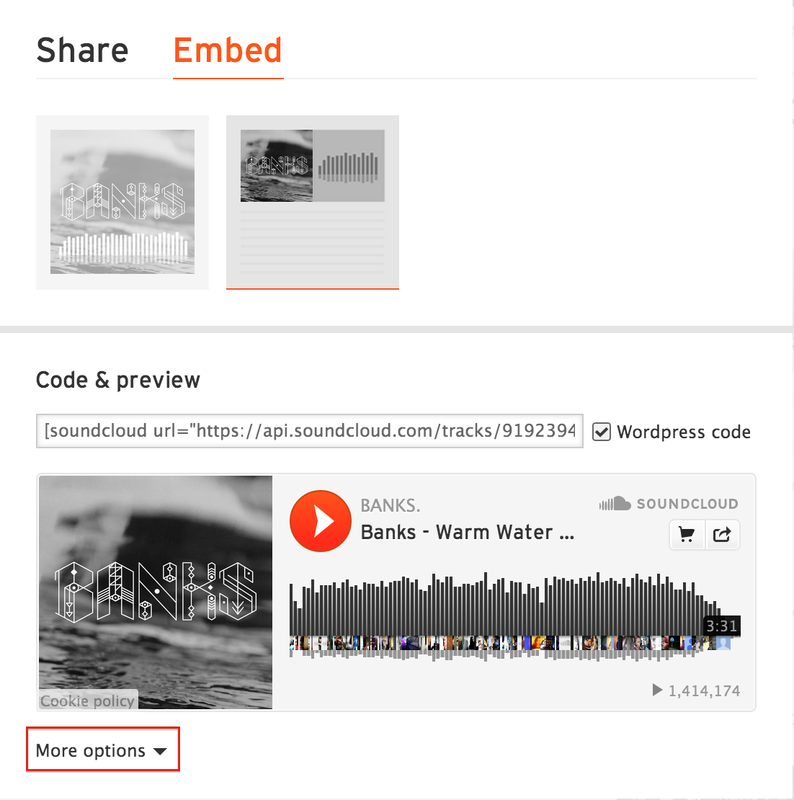 After clicking on the “Share” button, click on the tab that says “Embed.” You can select between two formats for embedding the track. The first format mimics a square album cover, while the second is a rectangular shape that features user comments and a smaller version of the album artwork. Now go to WordPress and Add new post then paste Embedded link into visual or text editor like this. Then Save and Publish Post your Media will appear on site.